Our Crooked Branch: A little too close for comfort…. 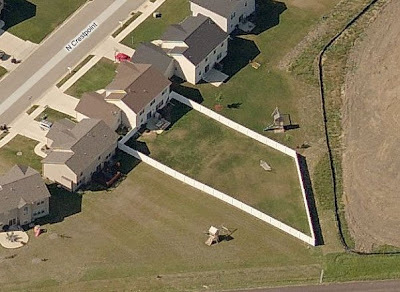 Apparently, if you go to maps.msn.com and put in your address, you can get a birds’ eye view of your house. LITERALLY. It’s a little creepy to me, but for you who always wonder what my big white fence looks like, there you go. Makes Addi running around in the backyard naked seem like a bit of a bigger deal. Even with the fence, someone is still watching.